Something Fishy This Way Comes . . .
What do you get when you add salmon to a salted water pot of boiling potatoes and onions? 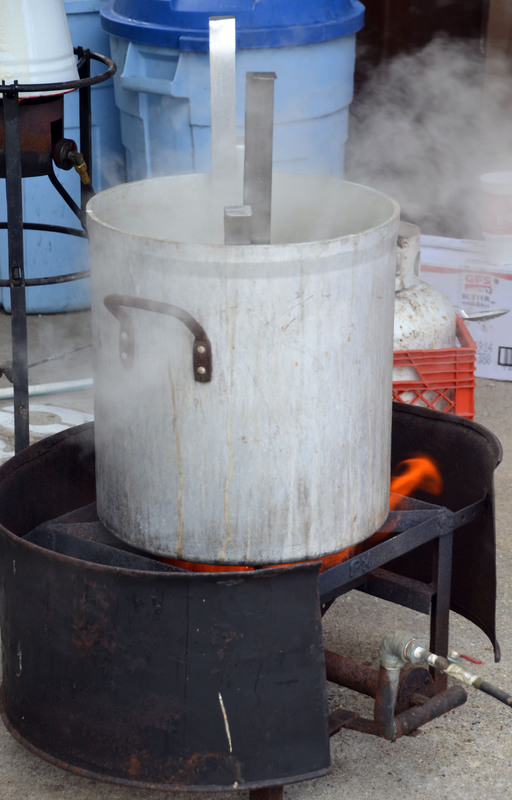 If it’s South Haven, Michigan at National Blueberry Festival time, an amazing Fish Boil, Lake Michigan style! 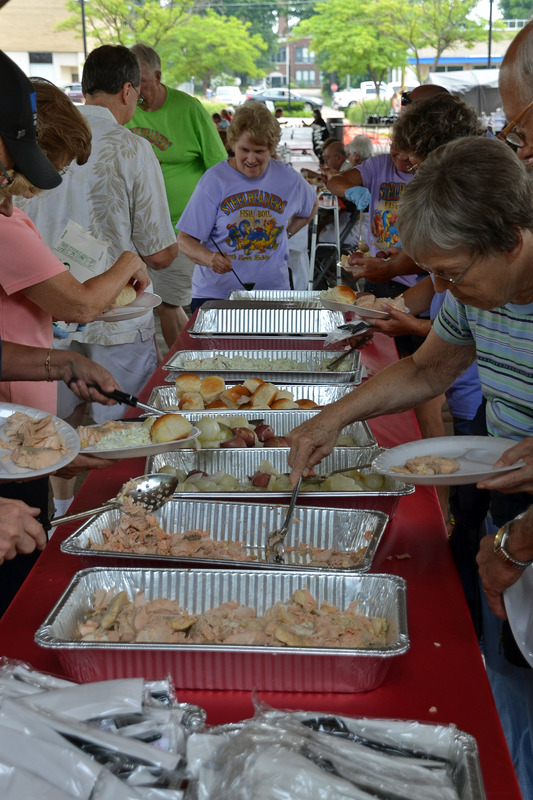 With over 40 years of fish boil experience, the South Haven Steelheaders (SHS) chapter of the Michigan Steelheaders and Salmon Fisherman’s Association, created a tasty treat for multitudes of hungry guests, including Two Who Trek, on August 8, 2015. 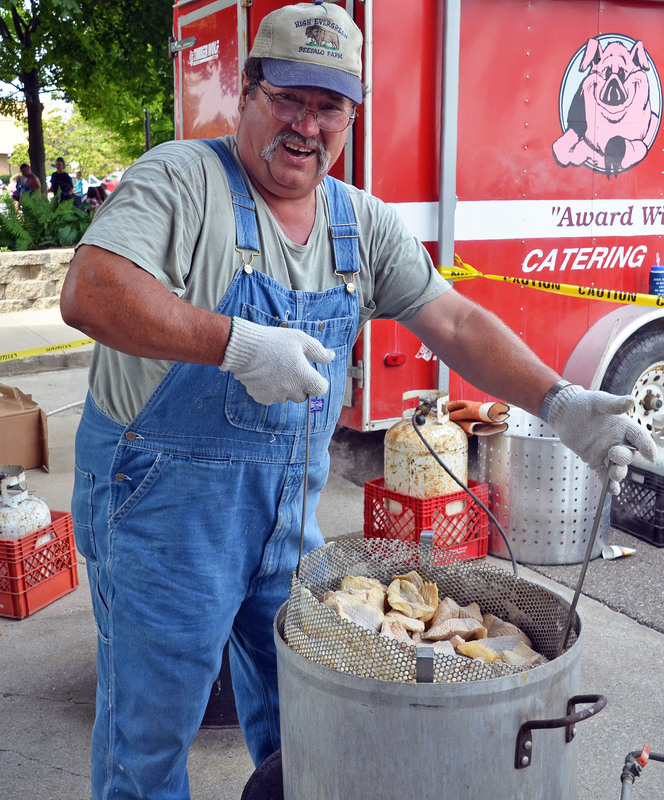 Proceeds from this annual event help support the South Haven area in many ways like academic scholarships, local youth athletics and community fireworks. The process starts in May at the SHS Pro/Am Tournament. 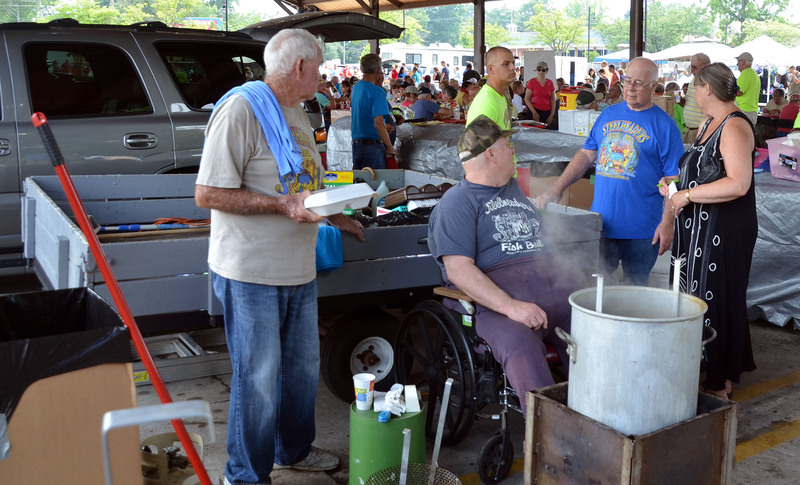 All fish caught on the first day of the two-day tournament are donated to the Fish Boil. The designated blue fish trailer (shown below) is filled with the catch-of-the-day which can be salmon, steelhead or trout. Donated fish on the first day of the tournament go into the blue trailer. (Steelhead are rainbow trout living in the Great Lakes. Although native to the Pacific Ocean along North America, they have been introduced to rivers and other fresh waters in North America.) The fish scales fly as 10-12 veteran anglers fillet the 800 pound catch. It is then packaged and frozen by a local, family-run business. 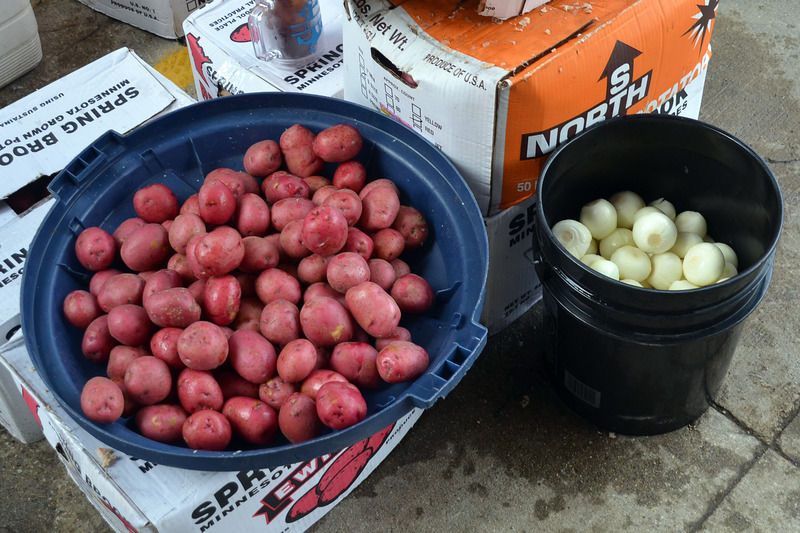 Hundreds of medium onions and red-skinned potatoes are cleaned and added to the pots on Boil Day. 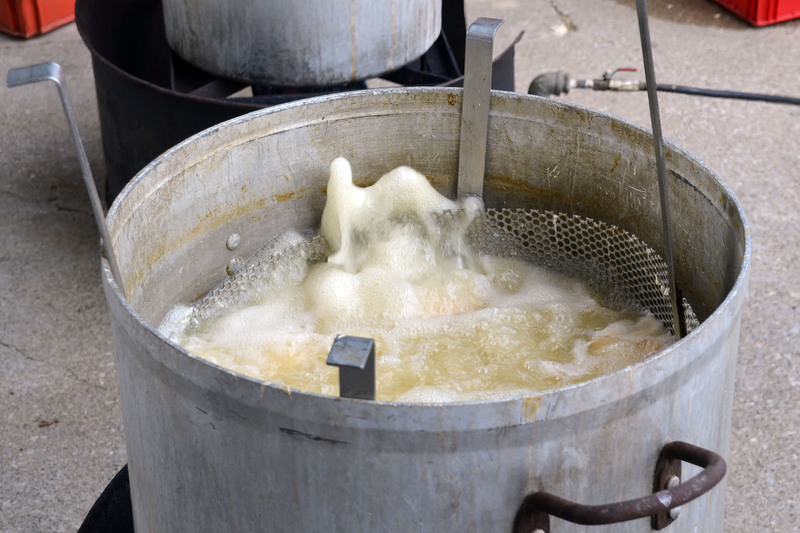 After the veggies boil in salted water for 20 minutes, the fish are added and lowered by baskets to cook for an additional 12 minutes. This guy really likes his job — and a nice person to boot. The smell is deliciously compelling, as the long line of diners move quickly to the serving tables. Self-serve dining with all the fish you can pile on a plate. 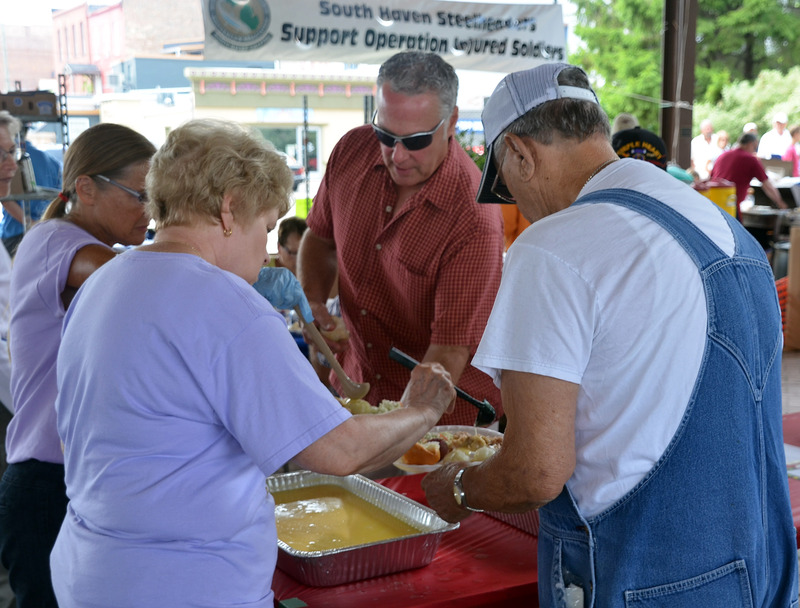 After loading up on fish, onions, potatoes, coleslaw and dinner rolls, lots of freshly melted butter is cheerfully offered by one of the 40 volunteers. Nothing says lovin’ like smotherin’ it in butter! The primary charity supported this year by the Steelheaders is shown on the sign in the background. SHS typically serves 900-1100 delicious meals in four hours. 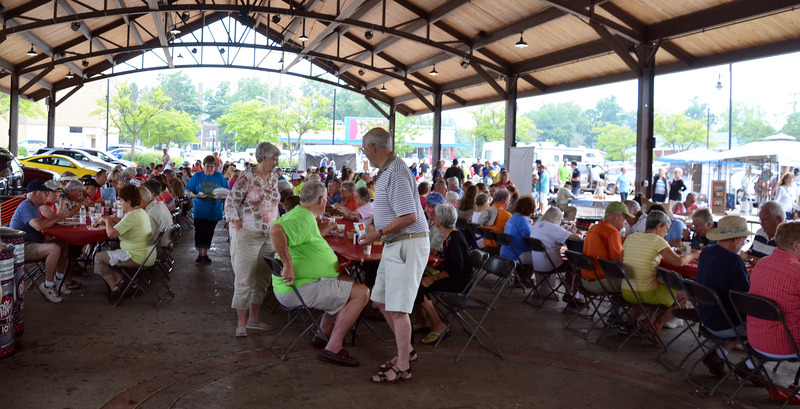 Next year, Two Who Trek plans a return visit to the Fish Boil on the second Saturday in August! 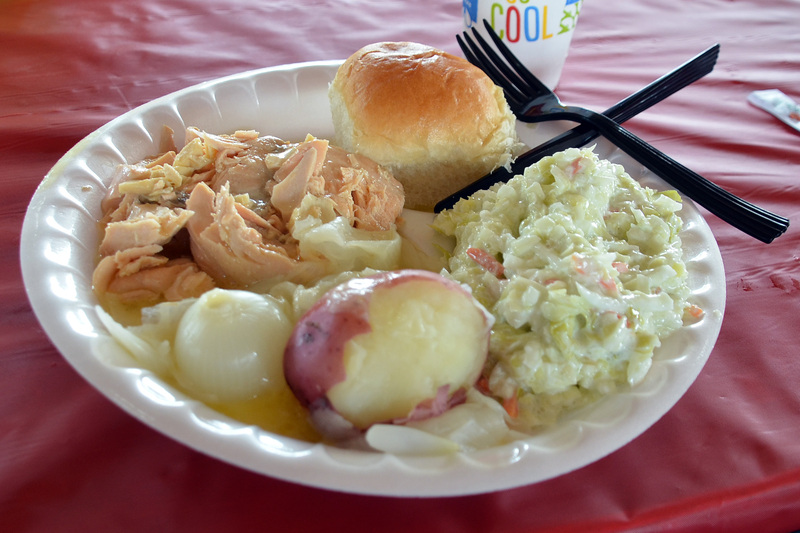 The fish, potatoes, and onions are covered with butter which seriously enhanced the flavor.